It’s almost one month that my tongue hasn’t had any contact with rice. I’ve been motivated through my readings that people who actually avoid rice from their intakes would have their weight decreased. To name few; Awal Shaari, Aznil Nawawi, Ziana Zain and Dafi AF5. And they who I am referring to are celebrities who have reason for doing that; they must look good in the television, or more precisely in shape enough to look good in front of camera. But how about me? Do I have any cameras to stand in front of them, or do I have any people to look me in the television? Absolutely no. However this change of diet of mine is due to the awareness of how far my body has been from the healthy BMI range. Let me reveal this. My height is about 1.80m while my previous weight before I started this change of dietary intake was 90kg or ++. Thus, the BMI value would yield 27.778 (weight in kg divided by height in meter to the power of 2) which is in the range of fat people. The fit people have BMI values within 20-25. Therefore, for me to reach at least 25, I have to decrease my weight up to 81kg, which is to some people still sounds scary. However, taking into account my height, it is considerably fit. For the benefit of monitoring my weight, I’ve bought a scale. I’ve measured my current weight; it is 88kg, which means I’ve fruitfully reduced about 2kg for one-month avoidance of rice. But back to the main topic, is rice the absolute culprit? Actually, rice contains complex carbohydrates which will yield a lot of glucose after being digested. Thus, foods containing complex carbohydrates like rice must go through levels of processes which take time before the yielded glucose can be actually used up to produce energy, and most importantly the digestion usually produces extra glucose. It is this extra glucose which will eventually be converted into fat for energy storage if they are not used. That’s the basic idea of how rice makes people fat. However it has to be stressed here; rice is NOT the mere culprit but since it is the most common meal for Malaysians, it has to be listed as one of the culprits though. where the input is the meal intake, while the output is anything that uses the products from the digested meal such as working, thinking, and exercising. If you eat more but you do activity less, how do you expect you will be thin? So to accelerate reducing my weight, I do some light exercises like sit-ups and lifting weighs. Owh... it’s not so accelerating considering only 2kg per month, but I believe I’m not torturing my body so much with this change. Along this period, I only miss nasi goreng kampong which is my favorite meal, but not nasi putih to accompany the lauk-pauk and vegetables for my lunch. Owh ya, I don’t take heavy meals for dinner also. Sometimes it’s only a cup of tea and a bar of chocolate. I hope I can continue this “revolution” for few months more before I can actually taste rice again. Hoho... sorry rice. We’ll see other time ya? Do you have any advise for me regarding this change of diet? I would love to hear it. Let's be supportive! My toes are big enough to cover the scale aren't them? ur BMI is lower than me.. mine is 29. to scary... if reach 30 and above, it is range of Obes people.. walla!!! * dulu pnah x makan nasi selama 3bulan, aku turun 12kg.. serius berjaya. cuma aku ni gila nasi.. sekejap je naik blk. so how? yea.. i'm wishing all d best jugak for the slimming down mission..
aku ni kot yg underweight.. haha. 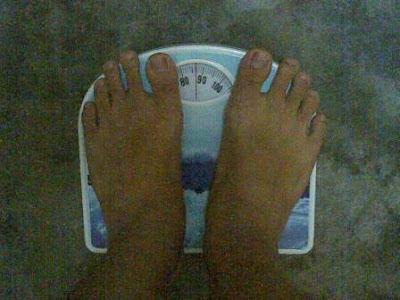 xpe2.. biar underweight janji nmpk macho.. bleh ke? akak rasa berat & ktinggian zaki kira stabil.akak punya side kurangkan makan nasi.paling best, minum nestum 3 in 1 & dont simply eat junkfood.kal.mulut rasa nak mengunyah jer..sila ambik buah. hemmm~~seriesly nak psan,sila jaga perut tu!!!muehehehe!!! ramai yang kate cam akak kate tu, tapi hakikatnye saye tetap gemuk ok~ ho... akak gemuk? takde la.. ok je saye tengok. tapi saye slalu dengar orang kate pompuan ni kekadang menyorokkan kegemukan mereka disebalik baju kurung mereka. nampak je kurus, walhal sebenarnye takdela sekurus yang disangkakan. betol ke? saye pun tak tahu..
dari segi luar memang nampak cam stabil, tapi hakikatnye BMI saye tinggi ok kak ila..
nak diet tak semestinye kena buang nasi, cuba exercise selalu. lagi satu, awak tu dahle renjong, kalu awak berat 100kg pun org takkan perasannye. the most important is, bersyukur dgn ape yg ade dn dgn ape yg zaki bleh makan, know what I mean?? heheh.. see ya at angklung training!! maybe bentuk muka akak yang tembam tu yang nampakkan akak cam gemuk.. pastu plak, kekadang ni lain penimbang lain bacaan nye. susah nak cari yang standard. nasihat saya, beli satu and put 'faith' on that scale only.. kang kalau timbang kat mesin lain2, keliru... ok? renjong tu tinggi ek? alo... kalau berat 100kg, mau lari orang2 tgk makin besar badan aku.. hehe~ takmo la 100kg. na'uzubillah! ye, saye bersyukur dengan apa yang saye makan (kejap aku, kejap saye ;p) and i know what u mean, but in this diet change, i have to make this decision. yup, u looked normal tp dh bmi kata gi tuh, kena turun ah ke normal kan? 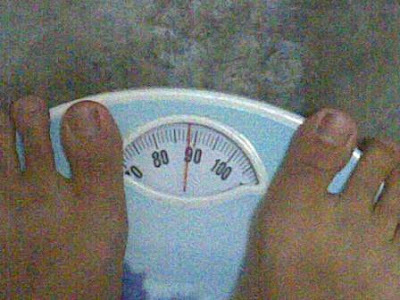 nway 2kg + x makan nasi...congratz! nak ketawa gak tapi rase bersalah plak. heh. do physical activity dat u love the most wt ur friends.hey,uia kuantan ada tmpt yg besau utk riadah...mana cukup dgn hectic lifestyle sbenarnya sbb utk bsenam kena buat repetitive action to build musle and burn fats.that's d defintion of exersice anyway. ask ur dietitian friends,they sure knw the answer.dont be demotivated..
owh itu indeks utk org asia ke? owh baru tahu.. that means saye kena turunkan lebih lagi la instead of 81kg? hm.. takpe2.. insya allah.. boleh..
FYI, saye tak buat atkins diet. saya tak elak amik carbs. i still eat mee and breads. arent they carbs also? cuma bila nasi je yang saye pantangkan. pasal once saya makan nasi, saya akan makan banyak. tu yang susah. pasal tu baik terus tak makan nasi, habis cerita. huhu..